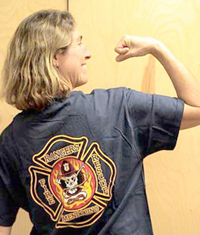 The Mendocino Volunteer Fire Department is supported by some tax dollars and a lot of community support through donations. The purchase of items we offer here helps us maintain the protection of life and property that our community has come to depend on. Thank you for your support. The shirts shown below are all available in adult unisex sizes S–XXL, and in youth sizes in the Hoodie and Blue T-shirt. From left to right, Gray Zip Sweatshirt; Blue Zip Sweatshirt; Ranger T-shirt; Ranger Hoodie; Blue T-shirt; Red T-shirt.